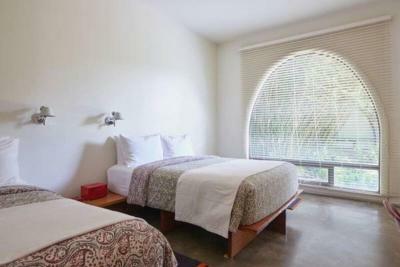 Lock in a great price for Hotel San Jose – rated 9 by recent guests! 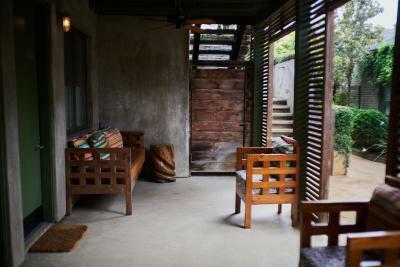 Quaint, eclectic minimalistic aesthetic with fantastically friendly and helpful staff. Excellent location for walking stuffs, convenient to everything. The in-room fridge and bar is dangerously well-equipped for all of your drunchie desires. A M A Z I N G pet friendly gem in a perfect location! Amazing design, really relaxing and cozy. Perfect in its simplicity. Pet-friendly too! Be sure and have a Frosé poolside. Gorgeous place, amazing room service breakfast. I highly recommend. 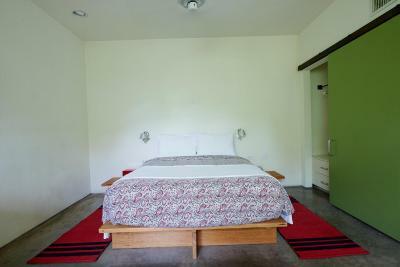 The property is beautiful, rooms are simple and have nicely designed finishes, great amenities! Love the location, Joes and the friendliness of the staff. Niki at front desk was awesome! Courtyard was gorgeous. Covered deck was lovely. 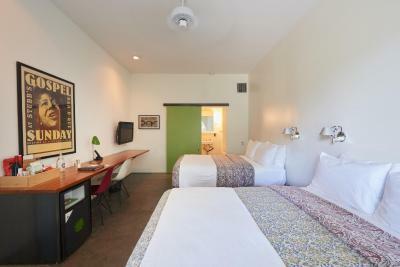 Clean, fun, and cute/funky hotel! Real keys! In walking distance to lots of amazing restaurants!! One of our best sellers in Austin! 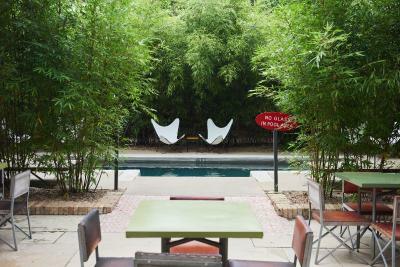 Located 1 mi from Austin Convention Center, Hotel San Jose offers 4-star accommodations in Austin and has an outdoor swimming pool. 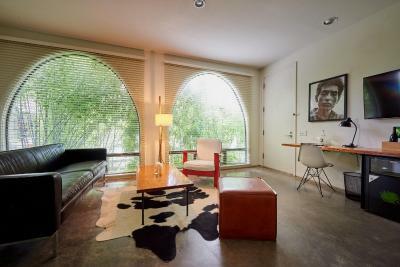 This property is set a short distance from attractions such as Palmer Events Center and Town Lake. Barton Springs Pool is 1.5 mi away. 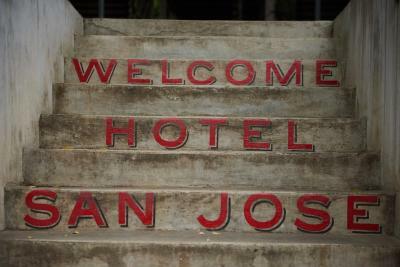 Staff at Hotel San Jose are always available to provide guidance at the reception. Capitol Building is 1.6 mi from the accommodations, while Frank Erwin Center - University of Texas is 2.1 mi from the property. 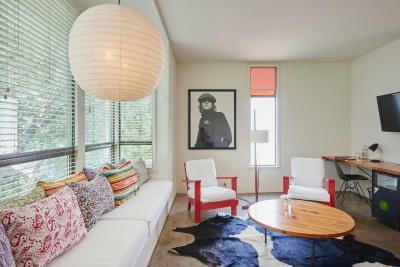 The nearest airport is Austin-Bergstrom International Airport, 6.2 mi from the property. This studio has air conditioning and mini-bar. 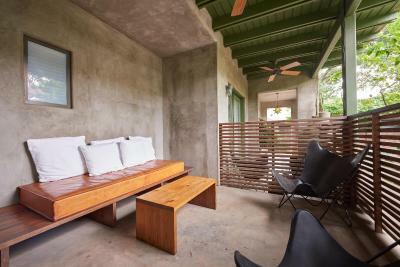 This studio features a mini-bar, air conditioning and cable TV. 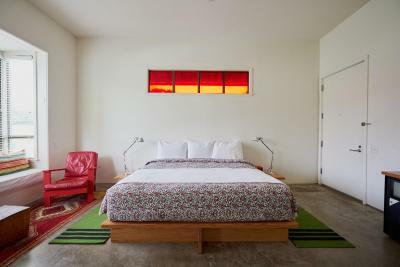 This studio has a flat-screen TV, air conditioning and mini-bar. We did not appreciate the concrete floors as it is cold to walk on in the middle of the night and when the temp outside is in the 50's. Also, given art we spent $ to stay there it was frustrating that we could not sit in the outside area as guests because it was filled with customers who were not staying there. We were directed to the restaurant, Kemuri Tatsu-ya by your staff twice. This is when I had called and asked to speak with the concierge-but was not told you did not have one. We saw other hotel guests there and it was a disappointing recommendation--we had to leave because we were not seated at 45 min past our reservation. also we were not alerted that there is not a wine list--a concierge would mention that. It felt like guests were directed to this location for an alternative reason. Our biggest complaint was that breakfast we had ordered to have in the courtyard could not happen because the kitchen did not have food!!! We were not told of this the night we ordered it, or even called in the morning to let us know we had to make other breakfast arrangements. This is really what was so unacceptable--I'm sure grocery stores are in Austin and provisions could have been provided. 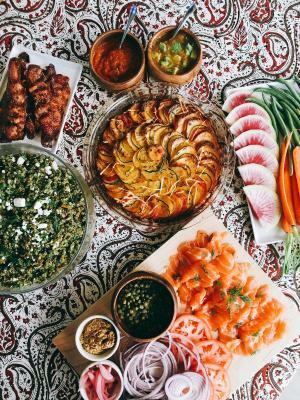 A hotel cannot say "we ran out of food." Bed is designed to bang your toes on the base. The whole place has a great sophisticated yet relaxed vibe. Location, room and decor were excellent. Very much enjoyed the proximity to Joe's Coffee, running trail and shopping. Easy walk (~1 mile) to downtown Austin. A bit bare bones decor for the price. Minifrig glass door so lights up whole room while sleeping. Location. Jo's next door. Pleasant staff. Nothing that deserves recording here. 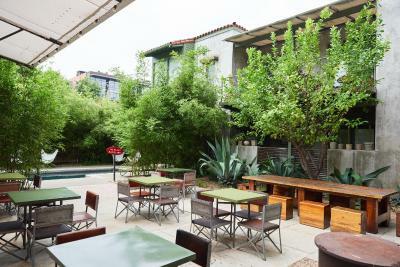 This hotel's main attractions are its low-key youthful energy, its helpful and cheerful youthful staff, its unpretentious yet efficient service, its overall bonhomie - all of which are real virtues for travellers, especially late middle-aged travellers like us. (It is very dog-friendly which wouldn't be high on our list of requirements, but never mind - that's simply the bonhomie extended.) It feels more hostel than hotel (we went next door for breakfast to Jo's cheerful and popular coffee & breakfast-taco stand associated with San Jose, and of course had to do so for dinner) but this suits the neo-counter-culture feel of the South Congress neighbourhood in which it sits - reminiscent personally for me of such neighbourhoods in Sixties & Seventies Eugene and Vancouver, though of course up-marketed for today's tourists and with several excellent restaurants amid the hang-outs. 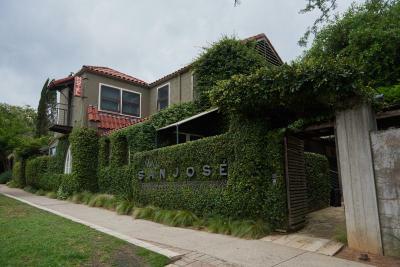 Should we return to Austin, we might try downtown for something different, but Hotel San Jose gets a hearty recommendation from us. It's a real achievement. Thank you, staff. Really exceeded our expectations. Perfect location and a truly excellent, cool spot to stay. 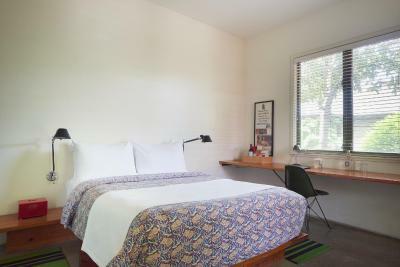 The grounds are beautiful, the rooms are comfy and the staff is first-rate! nothing! maybe that I left! Loved everything! Couldn’t have been better! Great little boutique hotel just as fab as it was 7 years ago, beautifully maintained grounds and minimalist spacious room (queen studio w patio) and great local coffee shop and location.